Fr. 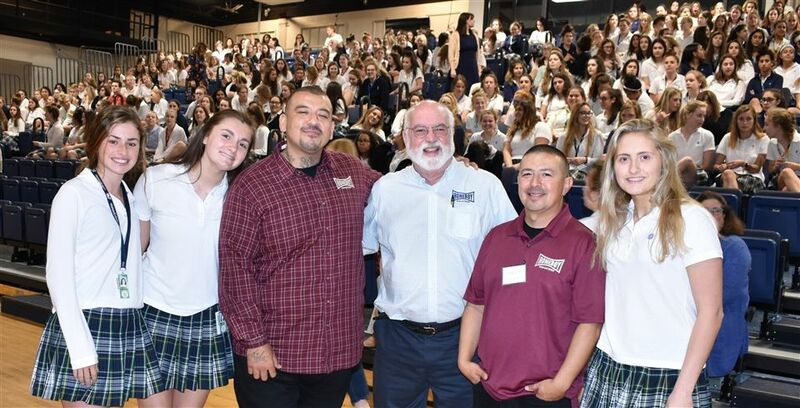 Gregory Boyle, SJ, author of Tattoos on the Heart: The Power of Boundless Compassion, visited Marian to speak with an audience of students, faculty, and parents. The founder of Homeboy Industries in Los Angeles, CA, the largest gang intervention program in the country, Fr. Boyle was accompanied by two employees of Homeboy Industries who also spoke to the assembly. Steve and Jose told of their families’ involvement in Los Angeles’ gang culture, their own brushes with the law, and the hope provided them by Homeboy Industries, a program that “treats gang members as human beings.” Today each man mentors other former gang members through the Homeboy Industries program, and Steve is a member of the Los Angeles Office of Gang Reduction. “Without kinship, there is no peace,” Fr. Boyle said. “Without kinship, there is no justice. Without kinship, there is no equality.” Kinship is one of the powerful themes of Fr. Boyle’s book, stories of gang members and his work with them. The entire Marian community had read Tattoos on the Heart as its all-school book during the 2016-2017 school year. Homeboy Industries provides support, training, and employment to formerly gang-involved and previously incarcerated men and women. Services include tattoo removal, anger management and parenting classes, legal assistance, substance abuse treatment, and job placement services. More than 200 former gang members are trained in each 18 month program. Fr. Boyle has written a second book entitled Barking to the Choir: The Power of Radical Kinship.